The Zika virus — a mosquito-borne disease similar to dengue, has now spread to more than 11 countries, including Brazil, El Salvador, Nicaragua, Venezuela, Guatemala and Columbia, with the World Health Organisation (WHO), stating that the outbreak is likely to spread throughout nearly all of the Americas, with at least twelve cases in the United States already confirmed by the CDC. 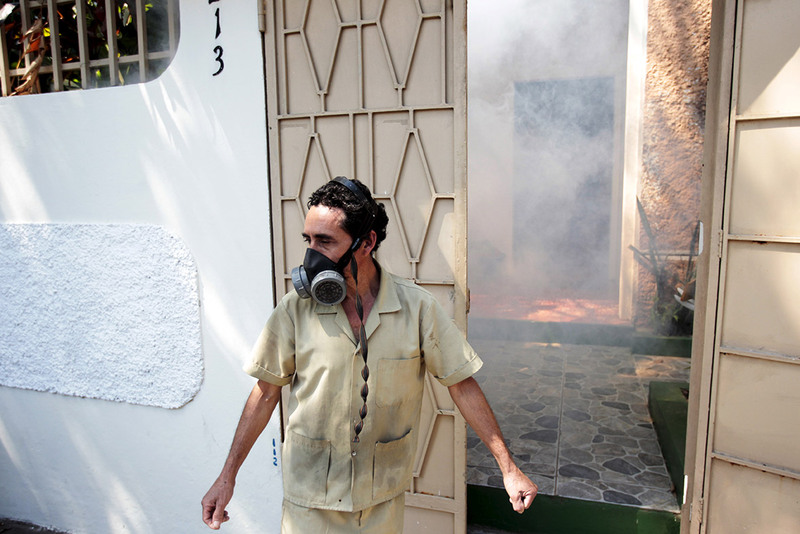 Exterminators have begun fumigating homes across the Americas in order to kill mosquitoes which may carry the disease. Recife, the capital of the Brazilian northeastern state of Pernambuco, is one of the regions that has been heavily effected by the virus, with health officials reporting that they believe as many as 100,000 people have been exposed to it but worryingly will never develop symptoms, making it harder to track. Authorities have advised that in order to prevent transmission, people should avoid places with stagnant water where the insects breed. The also recommend using repellent and wearing clothing that covers your body. Although cases of Zika are not too serious for adults, with symptoms similar to the flu with a lifespan no longer than seven days, it is pregnant women who are at the highest risk, especially their unborn baby, though the mechanics of how the virus directly affect babies remain unclear. What is known is that the virus seriously affects the development of the unborn foetus, meaning that the child is born with suspected microcephaly — abnormal smallness of the head, a congenital condition associated with incomplete brain development. This suggests that the virus affects the development of the baby when inside the womb, resulting in many of the foetuses being miscarried, or dying shortly after birth. Those who survive tend to suffer from severe health problems. First discovered in a monkey in 1947 in the Zika Forest, Uganda, the Zika virus went on to appear ten years later in Nigeria, with the first confirmed outbreak occurring in Micronesia island of Yap in 2007. There were around 180 confirmed cases. Venezuela now has recorded 4,700 suspected cases of people infected by the Zika virus, which is thought to cause brain damage in babies, the health ministry has said. The Government of Nicaragua announced a plan in order to stop the Zika virus from arriving in the country. A Nicaraguan government spokeswoman, Rosario Murillo, announced a new positive case of Zika in Managua city, bringing confirmed cases in the country to three.